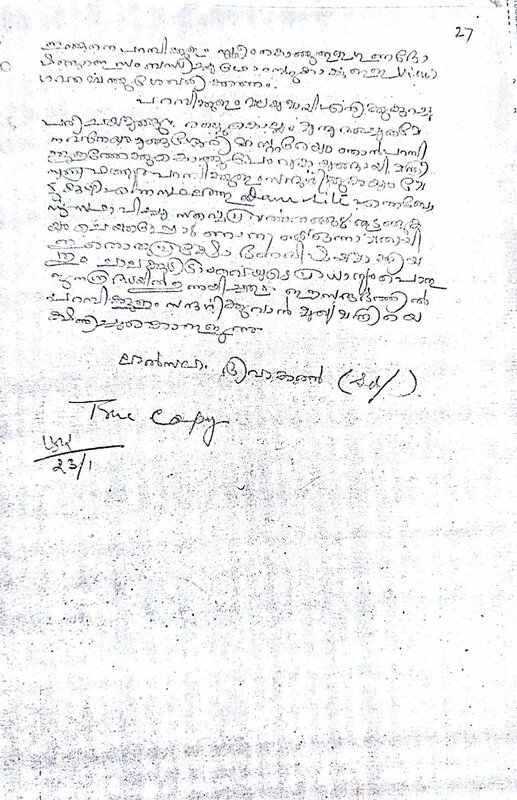 How many dams are there in Achecoil, Manimala & Meenachil which created havoc in Central Kerala? How much yield of Pamba River is impounded in the dams there? There you have the Great Chaliyar River, which flows through Kozhikode and Malappuram Districts. How many dams are there is this Chaliyar River basin other than some small weirs? Why ur doing annual maintenance of Idukki machines whn the Monsoon is active? Why the Idamalayar is built? Is it basically power generating dam? 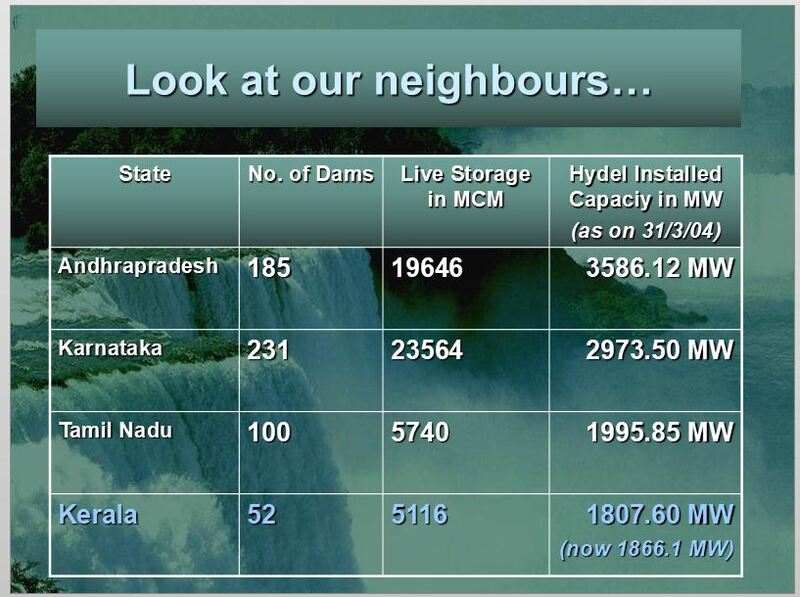 75 MW and 1020 MCM of water storage...It is built with a purpose of containing flood waters, giving irrigation potential and summer drinking water needs and to mitigate saline water intrusion..
Major problem is a perception problem. Unlike in Tamil Nadu, their PWD (WRO) own major dams, here in Kerala KSEB owns major dams. Here people think it is all greedy KSEB want to exploit the rivers. Look at how much of this controlled releases are used by Kerala Water Authority when the number of rainy days are getting less and meeting drinking water needs for people. What is the capacity of Thumboormoozhi weir? ZERO. What was the situation before Kerala Sholayar? We love to hear fantasy peddled as facts!! 3. We are taking bath by digging small pits in the river. 5. Saline intrusion is a great concern. 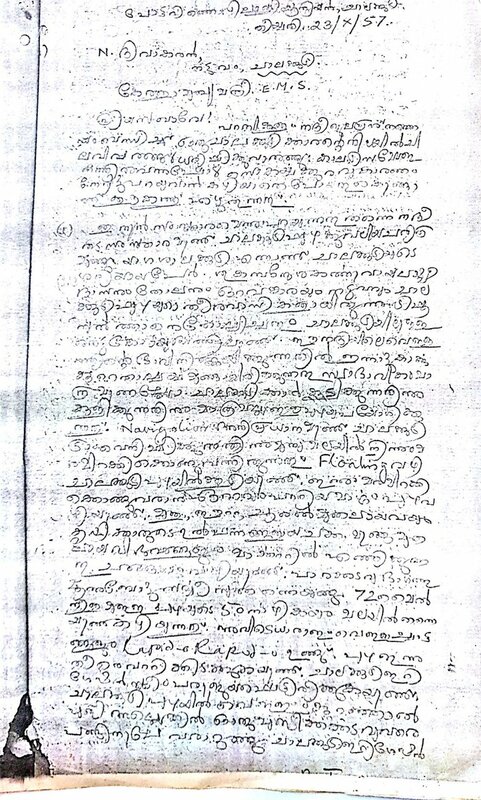 Come back to the discussion..
Periyar Valley Irrigation Project under Bhoothankettu Barrage with no appreciable storage receives water from Idamalayar + 7 small reservoirs in Mudirapuzha with 1185 MCM regulates 2740 MCM annually. Kuttiyadi Irrigation Project is an exception, which is not fully depend on the upstream KSEB reservoirs for its use. Even then for 2nd & 3rd crops KYIP need this water. So understand our forefathers developed these rivers primarily for Irrigation and drinking water, power generation was it's supplementary use. Kerala stores how much of its river water in these damn dams? Just 6.6% of annual flow! 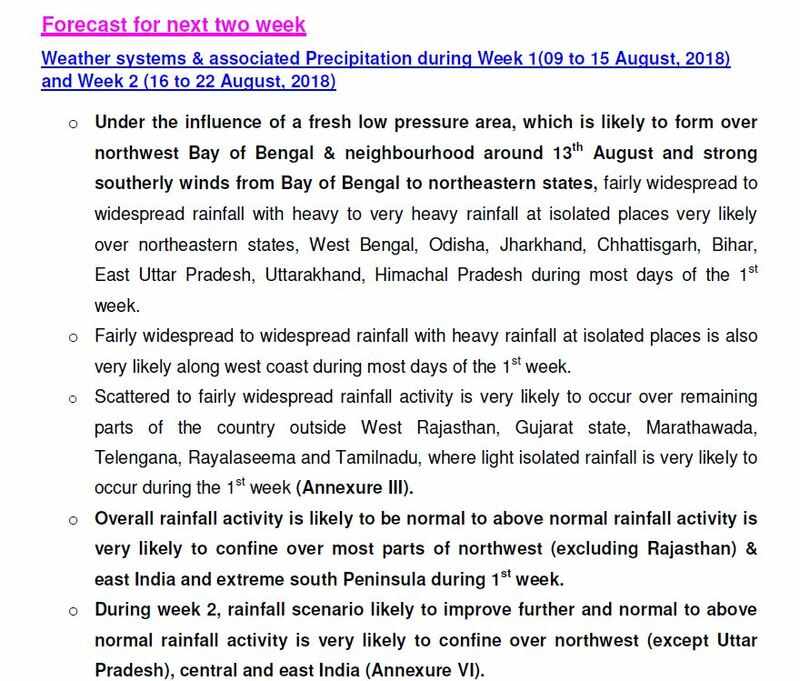 What this great IMD predicted for Kerala in their bulletin dated 9th August 2018 for next two weeks for Kerala? Then first suffer drinking water shortage..Then irrigation water problem..what electricity..u can even make that from waves!! But you greedy people not emptied your dams. Did not listen to our wisdom in hindsight!!! I forgot to put the inflow into the Idukki when this 9th prediction of IMD was there. 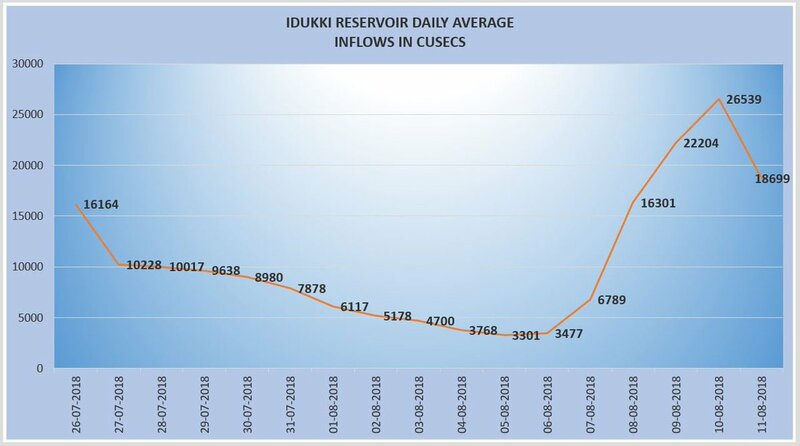 The inflow was declining day by day since 27th July and KSEB was generating power using more water than what is coming as inflow from 4/8/18 but our astrologers are asking why did not you foresee a 1 in 1000 year event & emptied your damn dams? In every year, the probability of such a flood event of 1 in 1000 year is 0.1%..
Why did not you don't have a FLOOD FORECASTING SYSTEM, oops.. These illiterates Mallus have no idea about the scientific advancement! Our catchment to dam travel time is just 4-5 hours it's fine with catchments having response time of 24 to 48 hours where you can act!! Any hydrology familiar engineer can sense a rising limb and recession limb if he look at hourly data and no qualitative input you are going to implement a flood forecasting system in catchments have short response time!!! Every flood and every drought is an opportunity for some experts to offer free wisdom. I am ready for debate and learn from the constructive dissent. Not ready to take agendas or vitriol..
Now realise how damn dammed is Kerala!! 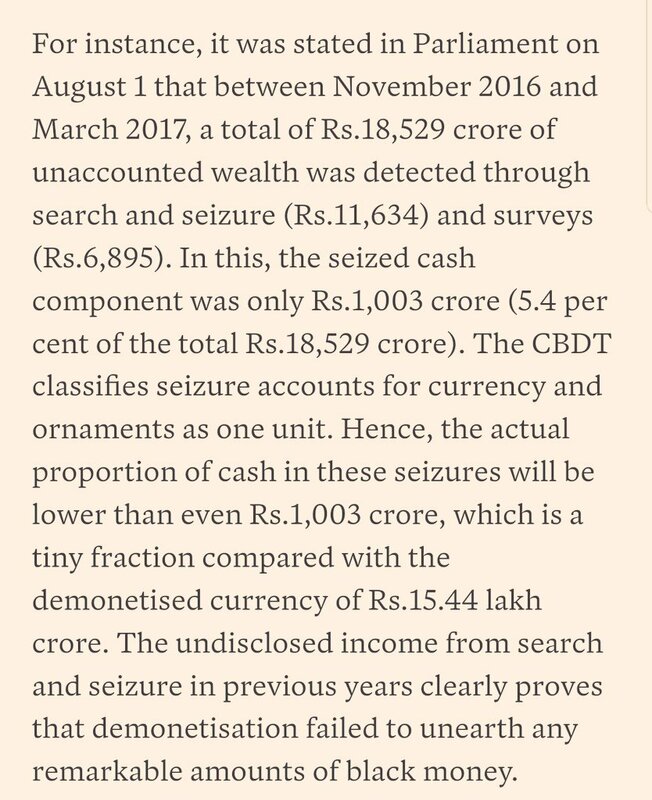 They claim that record income tax collections, claim record GST collection, raised petrol tax to the high, Spectrum & Coal re-aunctioned & got lakhs of crores.. Still, they dont have money to pay the rent of leased aircrafts for PM's world tours. Please listen to @databaazi, @iam_anandv and @digitaldutta. They all busted these lies regularly!! 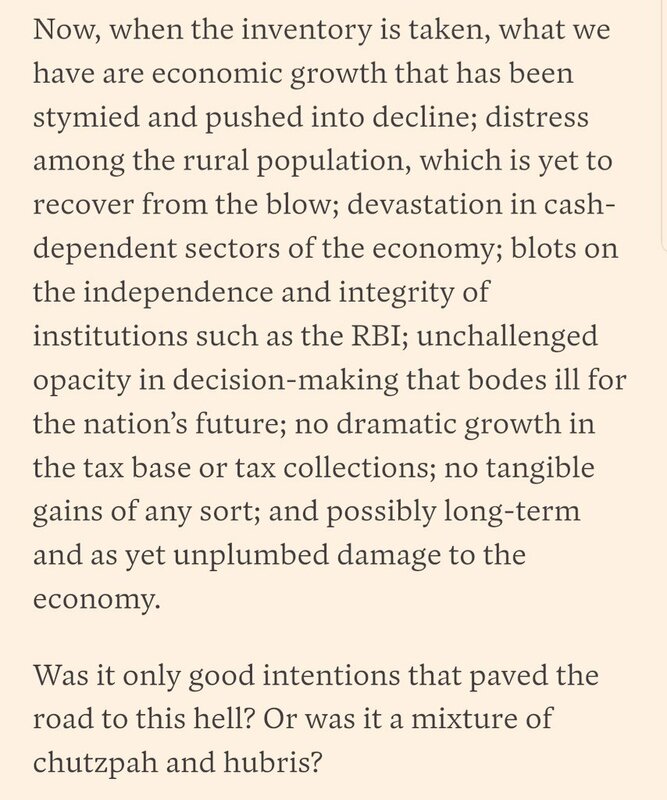 Why GoI depends on world bank to sell their claims? Put the raw data on the public domain for scrutiny. Also listen to @roadscholarz too. All these people are challenging these tall claims consistently here!!! Do I have followers in #Kerala? I was shown so much hospitality when I was there. So many people opened their homes to me, shared meals with me. I'd like to contribute to the flood relief efforts. But I'm not sure which organization is doing the best job of matching contributions to those most in need. Has anyone in Kerala seen, for example, one of these flood relief kits? Are they useful? amazon.in/b?ie=UTF8&node… Is there a local organization you'd recommend more? Perhaps you could recommend the best way, @TheKeralaPolice? Thread: Some #Kerala stats. Just a glimpse of where it stands in rel to the rest, for those who are riling against its "netas". Kerala does not have the kind of indignity and poverty that mark several Indian states. Instead, it is often compared with developed countries. Why? Bcoz Kerala is characterised by high literacy, incomes and expanded individual choices. Its literacy rate is 93.91%, among the highest rates in India. Average schooling in Kerala is eight to nine years, against four in the rest of India. In the realm of demographic transition, it will take the rest of India at least 30 years to catch up with its average demographic statistics. One of the worst floods Kerala has ever witnessed. 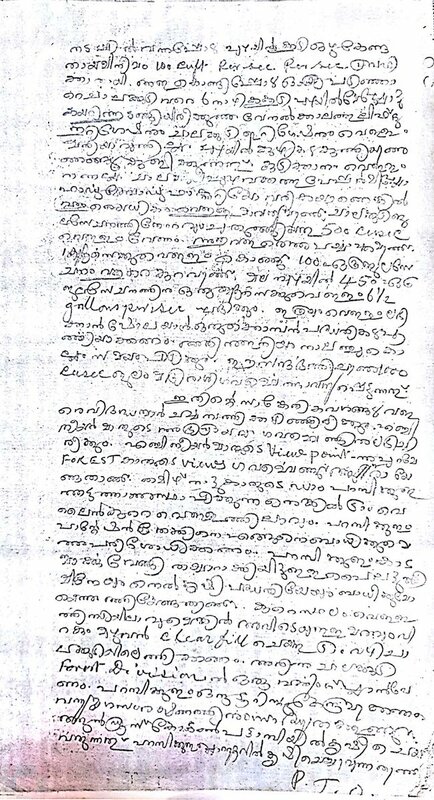 Thousands are still left in relief camps, with nowhere else to go..
Devikulam Sub-Collector Sriram Venkataram, who had the courage to lock horns with the mighty Church & political powerhouses in Kerala, captured national attention. 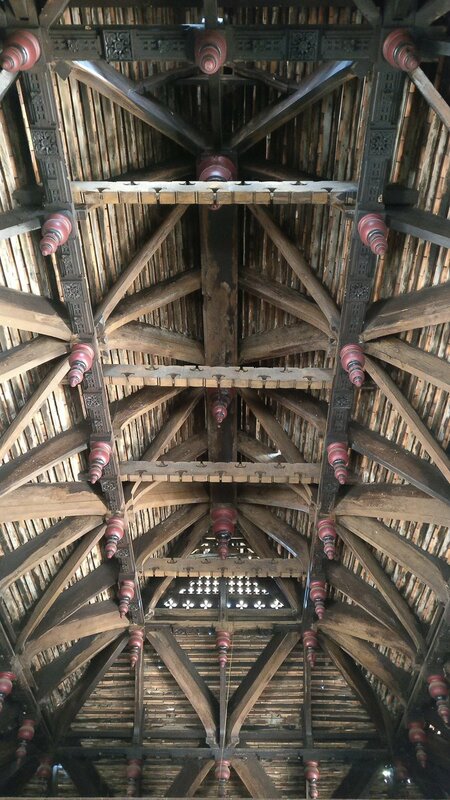 The ruins of ostentatious Keerikkara Anthony’s Church, built on the hilly, ecological sensitive Western Ghats, costing more than six crores..
#Kerala architects stood out in their mastery over wood sculpting. 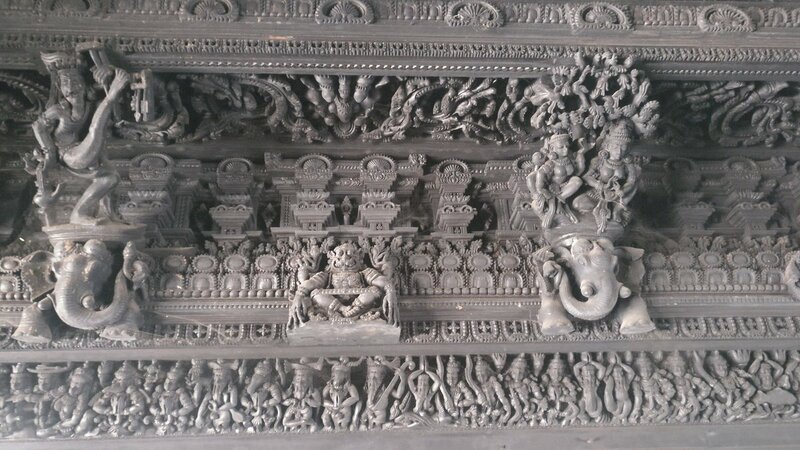 If you ask, why most of the temples in Kerala are not so architecturally minute in their making, the answer is: wood. Cheras largely worked with wood. This is the koothambalam of #haripad Subramanian temple. Because the entire structure was made of wood most of the grand temples succumbed to fire accidents. It was easy for invaders to raze it too. But remnants of it exist only in a handful of temples. See this video. #haripadsubramanian temple. 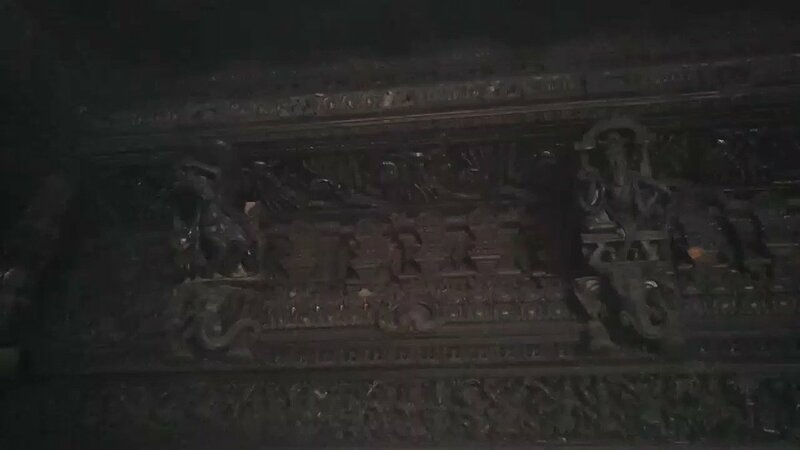 The ceiling of the koothambalam ( theatre) at #haripadsubramanian temple.